BACKGROUND AND PURPOSE: Although single-voxel proton MR spectroscopy is a noninvasive method that enables measurement of brain metabolite concentrations, it has been shown that physiologic brain motion causes inaccuracies in measurement of metabolite concentrations and increases the overall SD of the measurements when the stimulated echo acquisition mode (STEAM) is used. We tested the hypothesis that the point-resolved spectroscopy (PRESS) technique is less sensitive to physiologic brain motion than the STEAM technique. METHODS: In 10 healthy subjects, spectra were obtained from a voxel located in the left basal ganglia by using the PRESS sequence with cardiac gating and without water suppression to assess global phase change as a function of physiologic brain motion. This was accomplished by acquiring data at various time delays from the R wave throughout the cardiac cycle. Subsequently, spectra were obtained in 10 healthy subjects by using PRESS both without and with cardiac gating, and with water suppression, to determine whether brain motion resulted in a statistically significant difference in mean and SD of measured metabolite concentration. 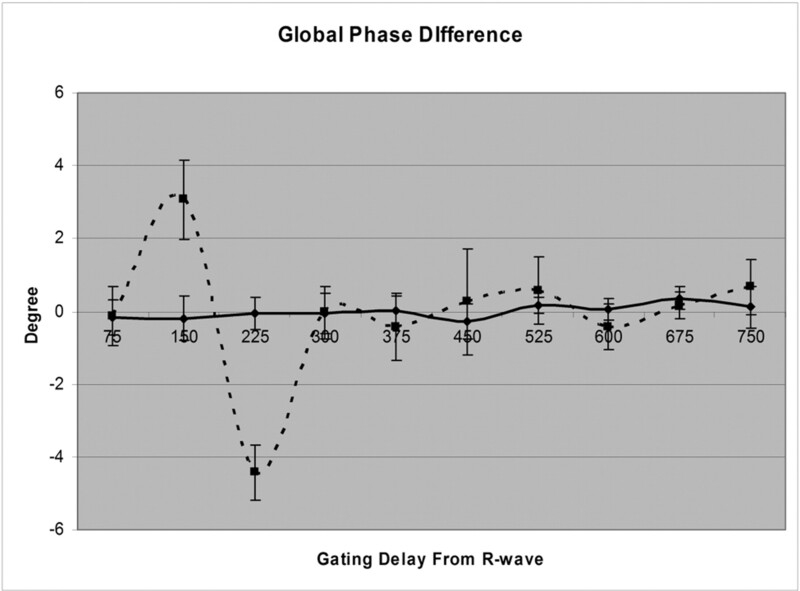 RESULTS: At various time delays from the R wave throughout the cardiac cycle, no significant global phase difference was noted in water signal intensity. In addition, when PRESS data were obtained both without and with cardiac gating (by using an optimal delay obtained from previously published data by using STEAM), no significant difference was seen in measured metabolite concentrations and SDs. CONCLUSION: The PRESS technique is relatively insensitive to physiologic brain motion. Several studies have been performed to assess the effects of brain motion on spectral data and have proposed techniques to minimize these effects. Posse et al6 examined the use of signal intensity tracking to perform motion artifact compensation. Felbinger et al7 reported on the use of retrospective gating to acquire water-suppressed spectral data. Katz-Brull et al8 investigated the effects of physiologic brain motion on point-resolved spectroscopy (PRESS) data by performing frame-by-frame analysis of frequency, phase, and amplitude variation. A study by Pattany et al9 used cardiac gating to obtain quantitative data on how physiologic brain motion affected spectral data with stimulated echo acquisition mode (STEAM) sequences. Pattany et al concluded that physiologic brain motion leads to inaccuracies in measurement of metabolite concentrations and increases the overall SD of measurements. In this study we tested the hypothesis that the PRESS technique is less sensitive to physiologic brain motion than the STEAM technique. where φ(t) indicates phase of magnetization packet at time t; γ, gyromagnetic ratio; G(t), gradient at time t; and z(t), position of magnetization packet at time t.
where φ(t) indicates phase of magnetization packet at time t; γ, gyromagnetic ratio; G(t), gradient at time t; z(t), position of magnetization packet at time t; V, velocity; A, acceleration; and P = pulsatility. If phase differences due to motion are minimized, less signal intensity attenuation will occur and, therefore, more accurate measurements will be obtained. Schematic representation of the PRESS sequence used to acquire spectral data. The unshaded gradients pulsed are applied in the x, y, and z axes for voxel selection. The shaded gradient pulses are dephase-rephase gradients, which remove the spurious signal intensity generated by RF inhomogeneities. The 90° and 180° RF pulses are indicated. The time window for data sampling is also indicated. Twenty healthy male subjects (age range, 28–49 years; mean age, 33 years) were recruited for this study and divided equally into 2 groups. Informed consent was obtained from each subject in accordance with guidelines of our institutional review board’s human subjects committee. During data acquisition, subjects were positioned in a headrest and secured with Velcro straps over their foreheads attached to the headrest assembly with foam pads placed on each side of the head. This served to limit gross head motion. The data were acquired by using a 1.5T MR system with a quadrature body coil as a transmitter and a quadrature head coil as a receiver. Scout images were acquired in 3 orthogonal planes. Axial proton-attenuation and T2-weighted images (3100/16, 96/1 [TR/effective TE/NEX]) were obtained with a section thickness of 5 mm, gap of 1 mm, field of view (FOV) of 230 mm, and in-plane image matrix of 256 × 256. For purposes of voxel placement, additional coronal and parasagittal T1-weighted images (200/20/1) with a section thickness of 5 mm, a FOV of 240 mm, and in-plane image matrix of 128 × 256 were acquired through the basal ganglia. An experienced neuroradiologist visually interpreted all images to ensure no abnormalities of the brain morphology on images were present. Part I: To Demonstrate the Effect of Brain Motion on the Global Phase of Water in the Basal Ganglia. The purpose of the first part of the study was to assess global phase change as a function of physiologic brain motion. This was accomplished by acquiring cardiac gated spectral data at various time delays from the R wave throughout the cardiac cycle from a voxel placed in the region of the left basal ganglia (Fig 2). In the first group of 10 subjects, spectra were obtained by using the PRESS sequence (2400–2600/135/16 [TR/TE/Nex]; bandwidth, 1000 Hz; 2048 data points) without water suppression. The start of the sequence was synchronized with every third R wave of the cardiac cycle in each subject by using electronic cardiac gating. Thus, the length of the repetition time (TR) was 3 R–R intervals. The water signal intensity data were acquired at 75-millisecond increments from the time of the R wave up to a delay of 750 milliseconds after the R wave. For each increment after the R wave, a global phase correction was performed by using the manufacturer’s provided spectral processing software. The mean global phase was calculated as the average of the global phase correction for all time increments. At each 75-millisecond increment, a global phase difference (global phase for the time increment minus mean global phase) was calculated. 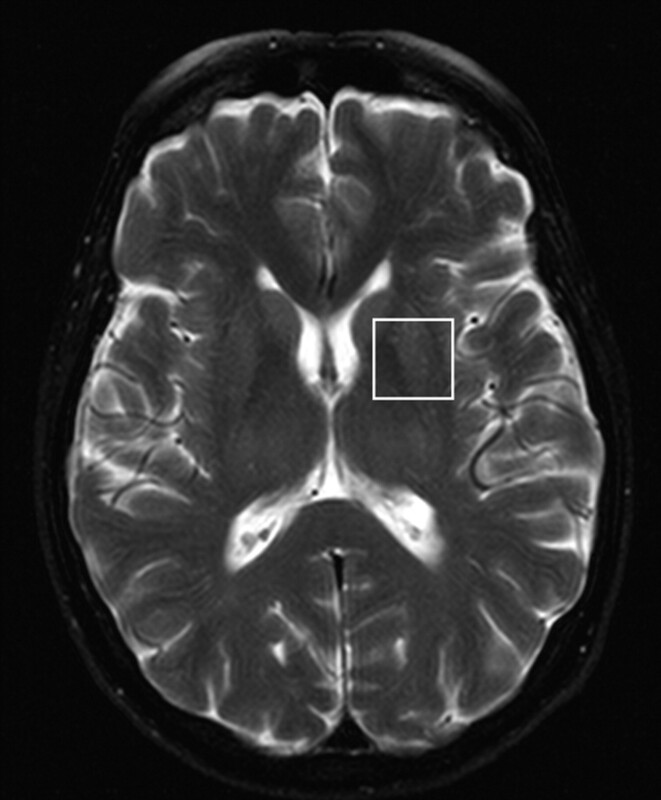 T2-weighted axial image demonstrating voxel placement in the region of the left basal ganglia. Part II: Water-Suppressed Acquisition with and without Cardiac Gating. In the second group of 10 subjects, spectra were obtained from the left basal ganglia with and without cardiac gating by using the PRESS sequence. At each session, imaging was performed and the cardiac waveform was monitored to determine the mean R–R interval for the subject. For the cardiac-gated, water-suppressed PRESS acquisition (2400–2600/135/256), the sequence was initiated at 400 milliseconds after the R wave. At 400 milliseconds, water suppression RF pulses, as well as gradients along the 3 orthogonal axes, were applied to dephase the water signal intensity. This process required 260 milliseconds, so the subsequent voxel selection occurred 660 milliseconds after the R wave. For the nongated, water-suppressed PRESS acquisition a TR equal to 3 R–R intervals was used. The metabolite concentrations were determined by using manufacturer supplied spectroscopy processing software, which determined the area under each of the metabolite peak in arbitrary units. To account for subject to subject variability in coil loading, the unsuppressed water signal intensity for each acquisition in every subject was normalized to the mean of the unsuppressed water signal intensity for all subjects. This normalization or correction factor was then divided into the concentration results for the corresponding subject. To remove any bias in the data due to the order of the spectral acquisition, gated and nongated acquisitions were alternated from subject to subject. Statistical analyses were performed by using 2-tailed Student t tests of 2 samples with unequal variance. The results of previous work by using the STEAM sequence9 are included in Fig 3 to compare these directly with the results of motion effects on the PRESS sequence. The STEAM acquisitions used an optimal delay of 660 milliseconds from the R wave for the gated portion of that study. Because this same delay resulted in a negligible global phase difference for the PRESS sequence, the delay of 660 milliseconds was used for the PRESS water-suppressed acquisition. Representative spectra are shown (Fig 4), to illustrate the spectral quality of gated (A) and nongated (B) PRESS acquisitions. No difference in spectral quality between the 2 methods was observed. PRESS spectra obtained from one subject, illustrating the spectral quality of gated (A) and nongated (B) acquisitions. This figure demonstrates that there is no difference in spectral quality between the 2 methods. As shown in Table 1, no significant differences were found in metabolite areas or in SDs of the mean metabolite values obtained without and with cardiac gating for the PRESS acquisitions. In performing MR spectroscopy, STEAM was the favored technique for many years because data could be acquired at short echo times. The STEAM sequence, however, has been shown to be sensitive to physiologic motion.9 To improve the accuracy of metabolite measurements, it is desirable to use a sequence that is inherently less sensitive to physiologic motion. Because of the even-echo rephrasing effect10 inherent in the PRESS sequence design, we hypothesized that the PRESS technique would be less sensitive to physiologic motion than the STEAM technique. Recently, Katz-Brull et al8 have used a different approach than ours to show that physiologic motion of the brain does not affect the single voxel PRESS technique at 3T. They acquired spectral data in a frame-by-frame mode from 3 different regions (centrum semiovale, cerebellum, and occipital cortex) of the brain. Each frame was stored separately, and then data were processed by using 2 methods: all the frames were corrected with same zero order phase-correction factor and the frequency was not registered; each frame was individually phased and the frequency of the water signal intensity in all of the frames was registered to 4.7 parts per million. Following each processing method the frames were summed and the amplitude and width (at half height) of the creatine (Cr) signal intensity were determined. They found that there was no significant difference in Cr signal intensity amplitude or line width between the 2 methods. It has been shown that motion is largest in the basal ganglia during systolic phase of the cardiac cycle.3 The movement of the basal ganglia is directed caudally, medially, and posteriorly. This is attributed to arterial expansion during the systolic phase of the cardiac cycle, resulting in expansion of the brain followed by venting of CSF to the spinal canal. During the diastolic phase of the cardiac cycle the process is reversed. Because movement of the basal ganglia has been documented previously, this study compares data acquired from the basal ganglia with the PRESS and STEAM techniques. As demonstrated in Fig 3, the deviation in global phase differences of water is relatively large at short delays from the R wave for the STEAM sequence. In contrast, across all delay times from the R wave, when the PRESS sequence was used, deviation in global phase differences of water is negligible. Hence, the nonwater-suppressed acquisition provided early indication that the PRESS sequence is inherently less sensitive to motion than the STEAM sequence. As shown in Table 1, the use of cardiac gating did not result in any statistically significant differences in metabolite measurements. Furthermore, the P values for the individual metabolites (gated vs nongated) were lower with the STEAM sequence9 than with the PRESS sequence, which indicates that any differences in measurements by using STEAM were less likely due to chance. Therefore, STEAM is more sensitive to physiologic motion than PRESS. The two 180° refocusing pulses used for voxel selection and generation of spectral data with PRESS may provide an effect analogous to even-echo rephasing in MR imaging. Even echoes on MR images are less susceptible to flow and motion.10 This may be the reason why the PRESS sequence is less affected by flow and motion compared with STEAM. In addition, at the same TE, PRESS will have higher (approximately √2) signal intensity to noise when compared with the STEAM sequence because PRESS uses 180° refocusing pulses to generate the spectral signal intensity. Because of hardware limitations, this study was performed by using a long-TE (135 milliseconds) PRESS technique. As shown in Table 1, the data indicate that PRESS is inherently less sensitive to physiologic brain motion even with long TEs. With improvements in hardware performance for current MR systems, a short-TE PRESS sequence (comparable to STEAM) exists. 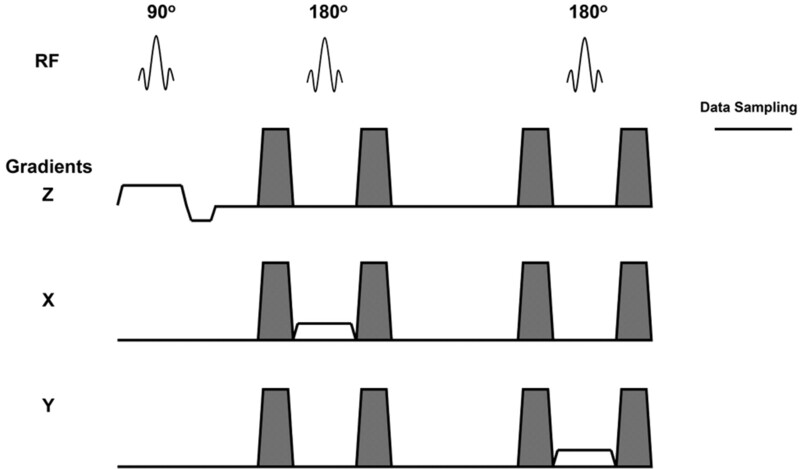 On the basis of the results of this study, use of PRESS sequence is advocated given the decreased sensitivity to motion and inherently higher signal intensity to noise when compared with STEAM sequence. In this study the repetition time varied between subjects depending on their heart rate, which could result in higher SDs. Because the PRESS method is less susceptible to motion artifacts, one could eliminate cardiac gating and with the use of identical repetition times for all the subjects the SDs will be further reduced. This in turn would provide accurate quantitative results that will improve clinical efficacy of MR spectroscopy. The effect of physiologic brain motion on proton spectroscopy is dependent on the pulse sequence used. The PRESS sequence is relatively insensitive to physiologic brain motion. The results of this study indicate that the PRESS sequence should be the method of choice when performing spectroscopy. It allows for more accurate measurements of metabolite concentrations, which in turn should improve clinical efficacy of in vivo proton spectroscopy. Accepted after revision October 7, 2005.